Here’s an interesting day or overnight trip that you might like to take this fall -- Morongo to Holcomb Valley. The route I recommend runs from Whitewater up through Morongo Pass on Highway 62 to Yucca Valley then northwest through Pioneer Town to Burns Canyon Road (Route 2N02) past the Rose Mine to Baldwin Lake Road. Turn right on Baldwin Lake Road continue across Highway 18 and on to Holcomb Valley Road (Route 3N16). Incidentally, Rose Mine is a good place to stop for lunch and, while you are there, you can try to locate the spot where the photograph (shown below) was taken by lining-up those mountain ranges in the background. Notice the changes in vegetation that have occurred over the past century. Unfortunately, nothing is left of the buildings in the foreground. 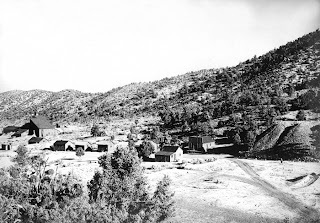 Holcomb Valley was a busy place in the early 1860s; sawmills churned out lumber for the growing town of San Bernardino, and miners and prospectors washed placer gold from numerous streams. The Civil War raged in the east during this period and caused a few fights to erupt between southern sympathizers and those favoring the Union. According to some accounts, gunfights and hangings were carried out without benefit of judge or jury. The county sheriff, fearing for his life, so the story goes, seldom made the long two day trip to enforce the law. The population reached 2,000 by 1861 rivaling the City of San Bernardino as the center of commerce. Social life center around the settlement of Belleville located near the middle of the valley. Figure on spending the good part of a day here just cruising back-county roads and checking out the sites. Be sure to get a good map of the area so that you can find your way around. If you leave by way of Coxey Wagon Road, check to make sure that the route is open all the way to Apple Valley.-– in fact, good idea to check all routes in and out of the area. Initially, access to Holcomb Valley was by way of Santa Ana Canyon Pack Trail which proved unsuited for wagons. Jed Van Dusen, the local blacksmith, was commissioned by business interests to build a road east from the existing route through Cajon Pass to Belleville. About the same time, a road was built up Cushenbury Canyon to serve the mines located to the east including Lone Valley, Rattlesnake Canyon and the Morongo area. It connected with a road from Rabbit Springs (now Lucerne Valley) to railroad sidings at Victor. From the upper end of the Cushenbury Canyon, a road extended southwest through Lone Valley to the Rose Mine and the Morongo Trail. This segment (3N03) is still in use, and referred to as Smarts Ranch Road. The U.S. Army map of this region (Survey of the West Beyond the 100th Meridian, Atlas Sheet 73, 1870-1878) shows these three routes Van Dusen, Cushenbury and Morongo Pass. Both Bear and Holcomb Valley provided summer pastures for cattle ranches from the 1880s to the end of WWII. During this period, pastures were not fenced and cattle generally wandered the “open range” finding feed and water wherever they could. The route outlined above follows the cattle drive-way from winter pastures on the desert to meadows in the mountains for spring and summer fattening. Cattle from Yucca Valley, Whitewater, and as far away as Palm Springs were driven to Warren’s ranch (Now the City of Yucca Valley) then up what is now Old Woman Springs Road to a place called “Windmill”. From here cattle turned west and started up the grade generally following Pipes Canyon to Burns Canyon Road and on to holding pens located at Rose Mine. Cattle wintering on the Mojave to the north followed Rattlesnake Canyon to the Rose Mine holding pens. Here the cattle were separated by brand markings and driven to their respective mountain pastures. In the fall the process was reversed as cattle move back down to winter in the desert. The high desert and adjacent San Bernardino Mountains held promise of great riches for some. In the early 1860, as mentioned, thousands came in search of gold and silver. In Holcomb Valley, it was said, you could scoop gold out of the sandy washes and stream beds with little effort. A few prospected in the canyons surrounding the valley for signs of quartz containing gold. Occasionally a “hard rock” mine would spring to life near a “ledge” bearing gold or silver -- a claim would be recorded, shafts would be sunk and tunnels dug along the ore body, and finally, a mill for extracting the metal from the ore would be constructed. Holcomb Valley had more than its share of both placer and hard rock mines. But, placers soon played out and most prospectors move on to new finds. A few lode or hard rock mines showed enough promise to attract investors (including Lucky Baldwin who made his fortune in the Nevada Comstock mines) but soon they too where abandoned. You can see evidence of the early mines and visit some of them on rough jeep trails. During the 1870, lode or hard rock mines and prospects were located in Lone Valley, Rattlesnake Canyon and on the upper slopes of Morongo Valley - - all located to the east and south of Holcomb Valley. The Rose Mine area may have been active during the time of Spanish rule. According to the State Mineralogist (1952 report), “The mine was worked by Americans probably in the 1860s” The first recorded claim was filed in 1887 and soon abandoned. In 1889, a claim was re-filed on the site, renamed “Rose Mine” and a 100 foot shaft was opened. The ore was judged to be of high quality quartz and calcite with streaks of hematite (iron). It occurred along a single mineralized zone in a limestone formation. In 1891, the property changed hands and the new owners, Morongo Mining and Milling Company, added a shaft and erected a four stamp mill for crushing and processing the ore. In 1896, a syndicate took over the operation and invested in state-of-the-art processing machinery for extracting gold in cyanide solution. Operations continued until 1903. Over this active seven year period, Rose Mine yielded gold, silver and a small amount of copper totaling a value of $450,000 and $600,000 making it the most productive gold mine in the San Bernardino Mountains. Workers lived in a small settlement at the mine and supported the usual assortment of businesses including a boarding house and a number of saloons. A post office was established here in 1899 but closed less than a year later.